We want you to share your story. We need you to share your story. Please, share your story! While all of these statements are flattering, they lack explanation. What does it mean when we ask those in agriculture to share their stories? Is providing a play-by-play of farming operations enough? Do they really want to hear about my multi-generational farming family, my no- till operation, this old horse-drawn plow sitting out behind the barn that my great-grandfather used? Do people really care? Should I let people into my life in this way even if I am skeptical? The answer to all of these questions is yes. Why we ask grower-owners to share their stories stems from one major reason: If you do not tell your story, someone else will tell it for you – possibly in the wrong way. As agriculturists, we get flustered when our industry is misrepresented or spoken poorly of in the media. So, then, why should we give those misrepresenting our industry the upper hand? Why would we not share our story in the right way first? WHAT DOES “SHARING YOUR STORY” MEAN? Associate Professor and Graduate Studies Coordinator for the Department of Agricultural Education and Communications at Texas Tech University, Courtney Meyers, Ph.D., has made a career out of teaching students to share their agricultural stories, as well as how to share those stories for others. Telling others about personal experiences is a tale as old as time. From Biblical times when parables were major teaching tools to Native American cultures who did the same, there is a reason stories exist as opposed to only facts and figures. Many options are available when it comes to sharing your story with others. From candid social media posts to more polished magazine stories, anything is possible. Sharing your story might indicate an action as simple as posting a farming photo to Facebook or as agreeing to sit down for a media interview. In essence, you can tell your story alone, or if you prefer, you can enlist someone else, a trusted source, to tell it for you. Meyers said effective interviewing methods are something agricultural communications professors work to instill in their students every day so the correct story is told to its fullest extent. This helps ensure future agricultural communicators, who may go on to work for commodity organizations and in other fields, will have the necessary skillset to accurately represent the two percent of Americans involved in the production of food and fiber. One way to identify a source worthy of sharing your story is not if, but how they listen to you. Now that you have some options for telling others about your experiences, try not to let fear get in the way. Take a step back and do a quick self-evaluation, briefly setting humility aside. You are unique. You do have a special story – even if you think differently. Now that you know why and where you can share your story, see Meyers’ recommended steps to realizing you have a story to tell. Reflect. Take a moment to reflect on your lifetime, your parents’ and grandparents’ lifetimes – were there any significant events? How long has your family been farming? What are some of the hardships you have faced and overcome? “I can fondly remember many stories about my grandma and the adventures she had growing up on the farm before running water and electricity in the home,” Meyers said. She said these stories were memorable because they were about her grandmother overcoming obstacles and hardships. As our brains can only contain so much information at a given point in time, using photos to bring back long-forgotten memories is another valuable reflection method. As Meyers said, people love visuals. “We have all heard the saying, ‘A picture is worth a thousand words,’ and there is a reason for that,” she said. Find the humor. At times, light-hearted and funny stories can be just as effective as those that are more heartfelt. After all, a smile and laugh are good for the soul too. Think about what others may want to know or find interesting. Take a step out of your own shoes for a moment. Think about what others may not know that comes naturally to you. Do not be afraid to let people look inside your life a little and learn from your experiences. Now that you have more insight on the “why” behind the need in sharing your agricultural story, take action. Share a photo on Facebook or Instagram, write a post about your most recent comical experience on Twitter, or even make a Snapchat video. If nothing else, tell your neighbor about what happened in the field yesterday. When the waitress at the restaurant notices your dirty boots and jeans, take it as an opportunity to explain that you work to feed and clothe the nation. Opportunities for sharing your story are everywhere, you just have to recognize them. If you have a story you would like to share or know of someone with a story worthy of telling, we can help. Call the PCCA Communications Department at 806-763-8011. A native of Fulton, Kansas, Courtney Meyers, Ph.D., has always been part of two things: agriculture and communications. With parents who were English teachers and grandparents who farmed soybeans and milo, she said she came into the agricultural communications profession naturally. “I majored in agricultural communications from the time someone said, ‘Do you like math or writing better?’ and I picked writing,” Meyers said. While earning her bachelor’s degree from the College of Agriculture at Kansas State University, Meyers worked as the communications specialist for the International Grains Program at the same institution. It was there she learned about the global aspects of agriculture and how much was possible in the field, which led her to earn her master’s degree from the University of Arkansas and later her doctorate from the University of Florida. 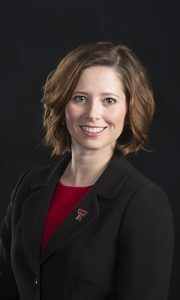 She joined the Texas Tech faculty in the fall of 2008. Earning degrees from universities in three different states also provided the Kansas native with the opportunity to experience agriculture in different regions. At Texas Tech University in the College of Agricultural Sciences and Natural Resources, Meyers teaches web design and public relations writing, better identified as “communicating agriculture to the public”, at the undergraduate level. She said she enjoys teaching students technical communications skills while helping them understand and realize the complex nature of agriculture and how important effective communication about it is. Molding students into effective agricultural communicators is one way Meyers is working to combat the increasing lack of trust in science among members of society. She said what appears as non-existent trust only in agriculture is actually the absence of trust in science as a whole. Meyers also has a unique perspective on agricultural communications and the ever- present need it presents to push boundaries – a fact that plays into her role as an agricultural communications educator and teaching students to reach beyond their comfort zones.